A soldier fights the darkness by going home to family and finds a flashy sound tech who's waiting for him. Basil Wallstatt, former USMC sniper, is fighting to regain control of his body, emotions and life. After surviving a helicopter crash, he's spent years in recovery. When he broke down and read the packet of letters from home, he knows it's time to return to Montana. He needs to repair the broken bonds within his family. 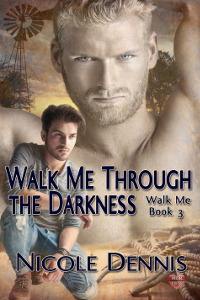 Even lost in the darkness of his past, he wonders if he can find the path back to the light. Sound technician for Midnight Twang, Thomas Bellamy isn't on stage, but dresses with enough flash and style to cover the rest of the band. He's happy to be their 'peacock' and work in the ranch's kitchen instead of riding a horse. One of the first to see the mysterious newcomer, he can't believe he's looking upon his childhood crush which still holds true now. With all of Basil's barriers, Thomas is determined to not let him disappear again. After all, he wasn't the only one who loves a Wallstatt sibling.